This spring Cumbria County Council are giving you the chance to learn a new craft with a community learning and skills workshop. The workshop will take place at the Castle Street Centre and will cost £20 for the 6 hour session. Attendees are asked to bring along old fabrics, such as cotton sheets and t-shirts. 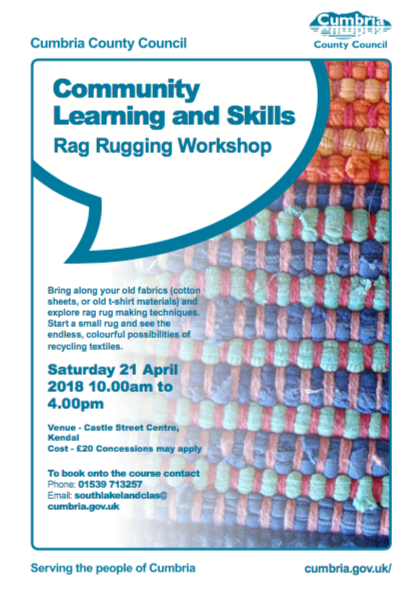 The workshop will provide each attendee with the opportunity to start a small rug and discover the exciting possibilities of recycling textiles. Booking is essential, to book please contact Cumbria County Council on 01539 713257 or email southlakelandclas@cumbria.gov.uk.